CADSharp is pleased to present its first product offering: CustomPropertyWorker. 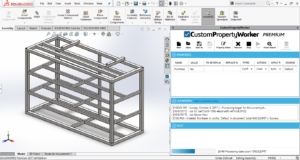 CPW is an addin compatible with SolidWorks 2014 and later that will let you automate your work involving custom properties in a variety of powerful ways depending on whether you have the free or premium version. CPW requires an active internet connection when it first loads (in order to check the license) and is compatible with SolidWorks 2014 and later. A regular expression is a special text string for describing a search pattern. 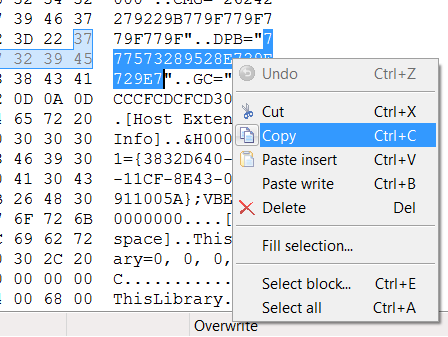 For example, if you’ve ever searched in Windows Explorer for “*.txt” in order to find all text files, then you’ve used regular expressions. The asterisk is a common example but barely the tip of the iceberg. To learn more about regular expressions and to test your regular expressions, visit here. CPW allow you edit component’s properties from within an assembly without having to open the document. Simply, select the component from the feature tree, right-click on the component and choose edit component properties. CPW reserves special strings for the purpose of dynamically creating custom property names and values. $$_Document_Title Processed document title. The document must be saved. CPW requires the user to launch SOLIDWORKS with administrator privileges for the first time only. 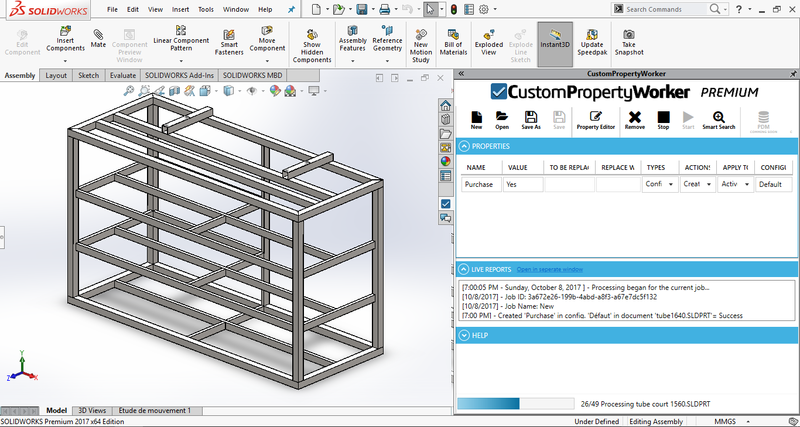 The add-in will attempt to copy some required resources to your SOLIDWORKS directory. Please make sure you can do this or contact your system administrator for support. This operation is required only once. Have any feedback for us? Let us know in the comments below! Want to keep up with new CADSharp offerings like CustomPropertyWorker? Sign up for our newsletter. 1. You will never find the perfect solution, so find something that works for you and just stick with it. The list of productivity and organizational tools is never-ending and many of them are largely redundant or only offer minute benefits over their competitors. Generally, you want to stick with tried and true options that obviously do not have an obvious overlap with your other tools. 2. Use a tool because it obviously makes you more productive / organized and for no other reason. If it is not clear to you how a tool might make you more productive or if the thought of using it stresses you out, don’t use it. It has taken me over five years to arrive at the point I am now. In some cases, I had to do something the inefficient way for years before it clicked in my mind how I ought to be doing it. 3. Don’t avoid a tool just because you’re afraid of the upfront work involved. This is the flip-side to the above: while you don’t want to force yourself into a workflow you’re not ready for, you could be hurting yourself by sticking with a workflow you know is inefficient. In my case, I balked at first of the hours it would take to migrate all of my prospective customers from Excel into Insightly (which I discuss below), but once I pulled the trigger it was a huge relief. Now, onto the software and tools I use. Visual Studio Community Edition 2017 is the IDE (Integrated Development Environment) that I use to write code in. Yes, you can write .NET programs in any text editor, but no sane person would ever do this unless they’re either masochistic or trying to prove something to yourself to the world. Anyway, why do I use the Community Edition specifically instead of a paid editions (Professional and Enterprise)? 2. It does everything I need and much more. Whereas the old Visual Studio Express Editions had limitations that were annoying to addin developers (since they required tedious workarounds), VSCE has very few limitations that are relevant to SolidWorks API developers. You can compare all of the editions here. 3. I prefer to use the same tools that my training students use. Since anyone can use VSCE for classroom learning, I prefer that all of my students are working with the exact same program I’m using to avoid any extra obstacles. Think of BitBucket as the programming equivalent of SolidWorks PDM, except in the programming world, it’s not called “PDM” but “SCM” (Source Code Management). SCM lets you manage revisions and control code access. Where it gets confusing is that BitBucket isn’t source control itself (the SCM system I use is actually called Git) but rather a service that let’s you store your repositories online so that you can collaborate with your team or customers more easily. If you’re new to source control, it’s a bit confusing at first but soon becomes apparent how essential it is. BitBucket has a famous competitor called GitHub. I use BitBucket because they allow free private repositories, whereas GitHub is only free for open-source (i.e., public) repositories. Beyond that, I can’t think of a reason I’m using BitBucket over GitHub. They both have great user interfaces, issue trackers, third-party tool integration, and everything else you could possibly want. Alternatives: Microsoft’s SCM is called Team Foundation Server and their BitBucket / GitHub equivalent is called Visual Studio Team Services. These tools are integrated into Visual Studio. I have never used these tools so I can’t comment on their quality or ease of use for small development teams. SourceTree is made by the same company that makes BitBucket (Atlassian) and is usually used in combination with BitBucket. I mentioned that BitBucket is an online tool for storing your code and collaborating with your team. Well, what about when you work on your code locally? How do you commit code (i.e., create revisions) in your local repository before its ready to push to your online repository? Well, Git (the name of source control system I use) lets you do all of that from the command line. Working from a command line, however, can be tedious. Enter SourceTree, which gives you a visual interface for common Git commands also a visual layout of your repository and its commit history. Is SourceTree necessary? No. Is it really useful? I think so. Evernote is a tool for remembering / storing information. Think of it as a database for text, images, and sound that you can easily organize and search. I use it to store lots of information about my business: code samples, programming tips, SolidWorks API technical support emails (that I copied and pasted into Evernote), the .NET guides I sell, blog post ideas, interview notes with prospective contractors, ideas for future projects, etc. Basically, anything that I would have kept in Word, Notepad, PDF, or email years ago. The problem is that searching for what you need is very difficult. You can’t search the contents of documents on your hard-drive en masse and working out of email is just annoying. Evernote solves this nicely: ALL of my infomation is in ONE place (though the information is still divided into separate notes) that is very easily searched. Moreover, if I need to share any of that information, I need only send the URL that links to that note. Dropbox needs no introduction to most people, I would imagine. Even if you’re not familiar with Dropbox, you might be familiar with the competitors it produced like Google Drive and Box. I don’t have much experience with its competitors because Dropbox always satisfied my file-syncing needs. Basically, I use Evernote to store text information and Dropbox to store everything else: images, sounds, videos, source code, and other non-text documents. You might be thinking, “Wait a second — didn’t you say you store your source code online with BitBucket?” BitBucket is an online repository, but when I work with my source code locally, it’s still stored on a hard-drive. I keep all of my projects within Dropbox so I know that they’re being backed up online. Same for all of my business related files. If my computer got lost, stolen, or destroyed, I would need only re-download all of my files onto my new computer. Of course, my work files take up far more than the 2 GB provided by the basic account, so I do have Dropbox Plus, which gives me 1 TB for 99 USD per year. Note that Dropbox does have plans designed for teams and businesses. I do not use them since most of my collaboration involves source code and tools like BitBucket are far superior for that kind of collaboration. Insightly CRM (Customer Resource Management) is what I use to store customer informations, opportunities / leads, and ongoing projects. I chose it because it is free for up to two users and is pretty simple to use. If I do upgrade to the paid version it will mostly be to customize the data fields more extensively, since I use so few of the built-in fields and would prefer to create my own. Slack lets you communicate with your team more effectively than via email. You can create a workspace for your company, invite people into that workspace, and give them access to public or private channels. For example, I and my contractors have a CADSharp workspace with a “general” channel that everyone has access to and private channels, named after customers, that only the contractors associated with those projects have accesss to. If I need to talk to a colleague about a project, I talk to them in that channel. That way we have a nice history of our conversation without cluttering our email inbox. Trello is a task / project management tool that has effectively killed off my messy, tedious, and unenjoyable to-do lists of the past. For a long time I used Trello only occasionally or half-heartedly, but as my list of projects increases and my need for collaborating with colleagues increases, the value of Trello becomes more and more apparent. Trello let’s me invite colleagues into a “board” (which usually contains a To Do, Doing, and Done list) where I can assign them tasks, assign priorities and due dates to those tasks, attach files to those tasks, and write comments in the task’s comment section. Some of this could be accomplished via Slack, but Trello is designed more specifically for task management whereas Slack is designed more for general intra-company communication. You can integrate your Trello boards into Slack, however, and this is a avenue I might pursue in the future as my team becomes more comfortable with both tools. Aside from its simplicity, another reason I use Trello over its competitors is that Trello integrates very nicely into BitBucket, which allows me to attach commits, branches, and pull requests to Trello cards. I didn’t list a particular email provider, because it doesn’t matter what email provider you’re using (or whether you’re using a web client or local client). Here’s what matters when it comes to email: You should only use email to communicate with people outside of your organization. In other words, you should NOT use email as a database, to-do list, or intra-company communication. “But Gmail has such powerful search and organizational features!” It does. You can create folders, tags, etc, as can many other email providers. But if you’re using email like this then you’re using it as a database, which is not its purpose. Likewise, if you’re leaving messages unread (or marking them as unread) to create a rudimentary to-do list, you’re using email wrong. Why? Because other programs serve that purpose much better. Once you have received information from the outside world, it should be immediately transferred to the appropriate place. In my case, that means my calendar if its a meeting or appointment, Evernote if its text information that I might need to look up later, Dropbox if its an attachment (e.g., SolidWorks models I need for testing a customer’s software), Trello if its a task, Insightly if I got the green light for a project, etc. This is called “one touch” email philosophy: every email that comes into your inbox you touch once and then you should never have to worry about it again. This is why I don’t use email folders or tags or do anything at all with my emails after I read them (they just stay in my inbox forever): they serve no purpose in the one-touch system. That being said, I also don’t delete any non-trivial emails, in the event that I made a mistake in transmitting the data elsewhere. Of all of the advice and strategies I’ve shared here, adopting the one-touch philosophy has been the most difficult. I used email as a database and to-do list for so many years that it is hard to kick the habit. Whereas some people have moved to Google Docs, I have not been inclined to do so for a few reasons. First, I prefer working out of desktop applications. Not because I’m “old-fashioned”, either. I just find working out a browser very unappealing not to mention I don’t like the feeling that I’m entirely dependent on an internet connection. Second, too many of my colleagues and customers still use Office products, particularly Excel. I don’t foresee Excel being replaced in many engineering workflows for the considerable future, which is why I have done numerous presentations on using the SolidWorks API and Excel API in tandem. I also use Excel for my accounting needs. When I started CADSharp, I considered using Quickbooks or Peachtree but immediately realized that my accounting needs were simple enough that Excel would do the job just fine. To this day, therefore, I have a single Excel workbook that contains all of my balance sheets and ledgers. Until this business reaches the point where I can justify hiring an accountant, I’ll probably just stick with my current workflow since it’s so simple. I use Skype for one-on-one meetings with international colleagues and clients. The downside of Skype is that while you can share your screen, you can’t control someone else’s computer. For that you will need GoToMeeting, Webex, JoinMe, etc. If the customer doesn’t have their own service they prefer, I tend to use JoinMe, since it’s free. In my professional life, I mainly use Google Calendar to schedule meetings with customers. Perhaps it could be replaced by Trello or Slack for this purpose, but for the time being it serves me just fine and, since I have to use it for my personal life, anyway, I don’t have a strong desire to replace it. Twitch.tv effectively lets any person create their own online television station. It’s mostly used by computer games who wish to stream themselves playing a particular game, but in recent years it’s become popular amongst artists and even software developers like myself. You may already know that I stream some of my work on Twitch. What you might not know is that I do this for productivity purposes more than marketing purposes. Yes, streaming does give me the opportunity to demonstrate my programming prowess to the world, but more importantly, it keeps me focused because I find it easier to stick to a task if I know people are watching me. I have also thoroughly enjoyed building relationships with the people who chat with me while I work. For those interested, I use Open Broadcaster Software to record myself while streaming. Pandora is a popular internet radio service that let’s you tailor stations according to your exact tastes. It’s also great for discovering new music. Spotify also accomplishes roughly the same thing, though it has more bells and whistles that I don’t care for. Anyway, I find that the right kind of music invigorates me while I work and therefore helps me stay focused. It helps push me through obstacles, you could say. If you’ve ever been on my Twitch.tv channel, you’ve probably heard me playing the station that I’ve spent the past five years tuning, which is an electic mix of electronica and instrumental, with a smattering of rock. Most of the songs do not have lyrics because I find lyrics distracting while working. 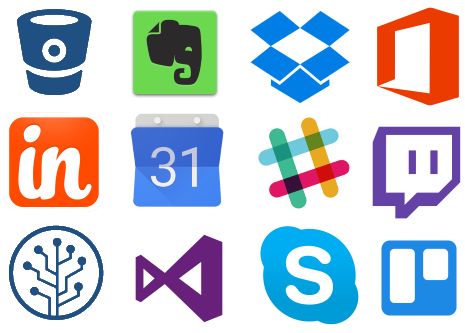 What productivity software could you or your team not live without? Please share in the comments below! Any VBA macro, whether for SolidWorks or an Microsoft Office product, can have be locked using a password. The password is required to view the source code but not run the macro. This creates a neat little safeguard against tampering on the part of curious users, but it is not, in my opinion, a safeguard against piracy, for two reason. First, as mentioned, locking a macro doesn’t stop anyone from running it. Second, VBA macros can be easily cracked, as this blog post will demonstrate. If piracy is a concern, I recommend that you create your program as a .NET addin or stand-alone and use obfuscation alongside a password mechanism. 1. Help those with legitimate reasons to access the source code to do so more quickly. 2. Highlight the insecurity of VBA macros, thereby encouraging programmers who want to protect their source code to use .NET addins or stand-alones instead. These three keys occur in two different places in the .swp, though I am not sure why. MSDN states exactly what these keys do. All three relate to the security mechanism, but, in particular, the DPB key contains the encrypted password. We don’t know what encryption algorithm Microsoft uses here and we don’t care. We just need to know that this is where the password is stored. With Excel macros, it is sometimes necessary to modify all three keys (and sometimes in both places where they occur in the macro file), but the technique I am going to show you has worked for me when I modify only the first instance of the DPB key. 1. Download and install HxD, which is a free and easy-to-use hex editor. 2. Create and save a new macro with a very short password, like the letter “a”. 3. Open this macro in HxD and search for “DPB”. 4. Copy the value of this key, as shown below. 5. Open Notepad and paste the value in. 6. Repeat steps 3-5 with the macro with the unknown password. 8. Back in HxD, replace the DPB key value for the unknown password with modified known password. 9. Save the macro in HxD. You should now be able to unlock this macro in SolidWorks using the password from step 2. 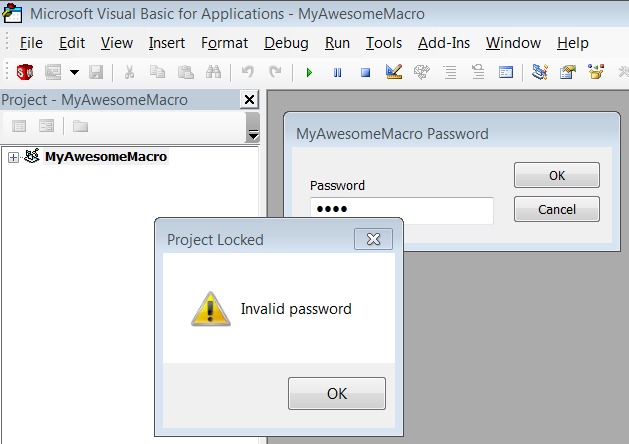 Don’t forget that you can remove the password entirely in the macro’s project properties. 1. Replacing the DPB key in both places in the macro instead of just the first occurrence. 2. Replacing the CMG, DPB, and GC key instead of just the DPB key. I do not know whether identical lengths need to be maintained for CMG and GC, or whether it necessary to replace both instances. Special thanks to Ivana K. for researching this technique.